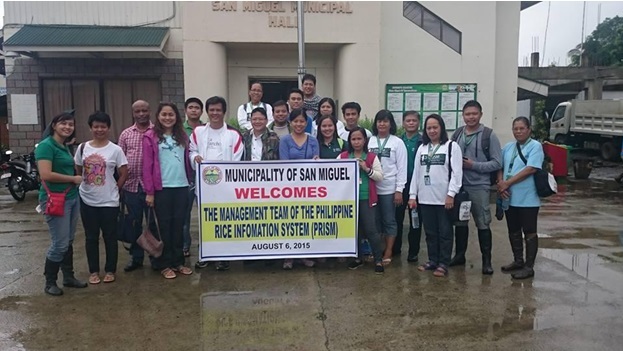 The PRISM management team at San Miguel, Iloilo, one of the municipalities that the project monitors. The management team (MT) of the Philippine Rice Information System (PRISM) Project conducted its third quarterly meeting in Iloilo City on 5 August 2015. This is the first PRISM MT meeting conducted outside of Luzon. The day before, the team took the opportunity to present the project outputs of the 2015 dry season to partners from the Department of Agriculture Regional Field Office VI (DA-RFO-VI, Western Visayas). They also handed over supplies, which included mobile phones, grain moisture meters, portable spring balances, and rubber boots. The day after the meeting, the team joined the DA-RFO-VI partners in collecting data from farmers’ fields. They also paid a courtesy call to Mayor Dunstan Claudio Sale of San Miguel, Iloilo, one of the municipalities monitored by PRISM. Mayor Sale and Vice Mayor Bonifacio Salapantan, Jr., joined the team during their monitoring activity—a clear indication of interest in and support for the project by partners in the local government unit. During the visit, IRRI scientist Nancy Castilla explained the causes and management of diseases and insect pest injuries that were observed in the area. Mr. Arnel Rala, another IRRI scientist, explained the use of electronic survey forms installed in smartphones for data collection and submission. The mayor acknowledged that, by generating timely and accurate information on rice, the project will help improve farmers’ knowledge on rice production. PRISM, a collaborative project among DA-PhilRice, DA-Bureau of Plant Industry, the DA-RFOs, and IRRI in support of the Department of Agriculture’s Food Staples Sufficiency Program, is funded by the National Rice Program through the Bureau of Agricultural Research. PRISM regional partners regularly collect data, which goes simultaneously with satellite image acquisition, from selected rice fields during a cropping season. They also interview farmers to collect information on cropping practices and data on pest injuries in the field at the booting and dough stages of the rice crop. There are 780 rice fields being monitored this wet season throughout the country; 60 of these are in the municipalities of San Miguel, Dingle, and Passi in Region VI.